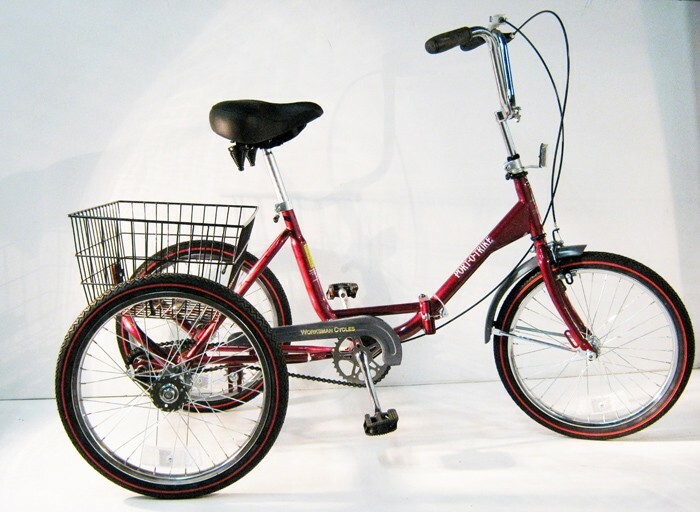 Deluxe 3 Speed (3 gears to choose from for easier pedaling)Port-o-trike Folding Adult Trike with 20" wheels with (Front Caliper Brake & Rear Coaster (foot)Brake)and rear basket. Compact Adult Trike. Overall Width 29.5". Folds to a 32x30x29.5" cube. Ships mostly assembled via UPS.Maximum Recommended Weight Capacity 225 pounds. I purchased my Port-O-Tryke PT3CB from the factory on o3/26/15. Before I purchased it I read a lot of reviews regarding purchases made from two major sellers. There were some good reviews and many bad. The bad reviews all seemed to have a common thread, parts missing, rims defective, paint chipped, no instructions,packaging damaged. I decided that since both these retailers take merchandise back they were possibly re-selling returns. Based on that assumption I decided to order direct from your factory. The cost was more and I had to wait for delivery about 6 weeks. It was worth it, Everything arrived in perfect condition. I am a 75 yr old female, I assembled it myself in about 4 hrs. The hardest part was getting it out of the box! I rode it to my local bike shop for a couple of minor adjustments to gears and hand break. Different to ride than a regular bile but easy to do and a dream once you get used to it. Goes up average to slightly steep hills easily and feels very stable. Very nice for flat terrain. It will take a slight rise, maybe 5%, if you work at it for short distances, eg 100ft. Crossing streets with a rise in the middle from a stop is challenging but swaying back and forth can get the pedals to a point where you can exert maximum push. It helps to lean back when you need extra push. It keeps you at a normal persons height so you can talk to a fellow rider or walker. On surfaces with a lot of irregularities you have to be alert and lean against the tendencies for the trike to tip into small crevices. But with time and experience a lot of the road irregularities become second nature to cross. With a bike you are always adjusting balance with minute steering adjustments so your center of downward force (combination of gravity and centrifugal force in turns) stays over a line between the two points of contact of the tires with the road. This means in turns you lean into the turn a little. This is impossible with a trike since you can't lean it. I did a lot of research before ordering this bike. At 79 years of age and having ridden bikes and motor cycles most of my life I knew what I wanted. It had to be light enough that I could lift it into the short bed of my Tacoma pickup. It had to be foldable to fit in the back of my RAV4 and have at least 3 speeds. Since I had read a lot of reviews, I purchased it through my local Walmart store after finding out they would assemble the trike and test it to make sure everything worked as it should. It met all my criteria and I rode it from the store to my pickup in the parking lot and liked the way it worked and handled. I rode it around the neighborhood as soon as I arrived home and feel I made a good choice. I intend to take it with me to visit campgrounds and get exercise at home. I have no cons to list at this time. I am very satisfied with my purchase. I approved this message, I just need help deciding who to vote for,lol. A good friend purchased a folding trike from Worksman and when I saw it and gave it a try, I knew I had to have one. It came with instructions, and there is also a video on You Tube that my husband used when putting it together and it was fairly easy. I never learned to ride a bicycle and as an adult have given it a few tries, but the speed and idea of a bad fall is terrifying, so at age 61 the trike is a wonderful alternative! 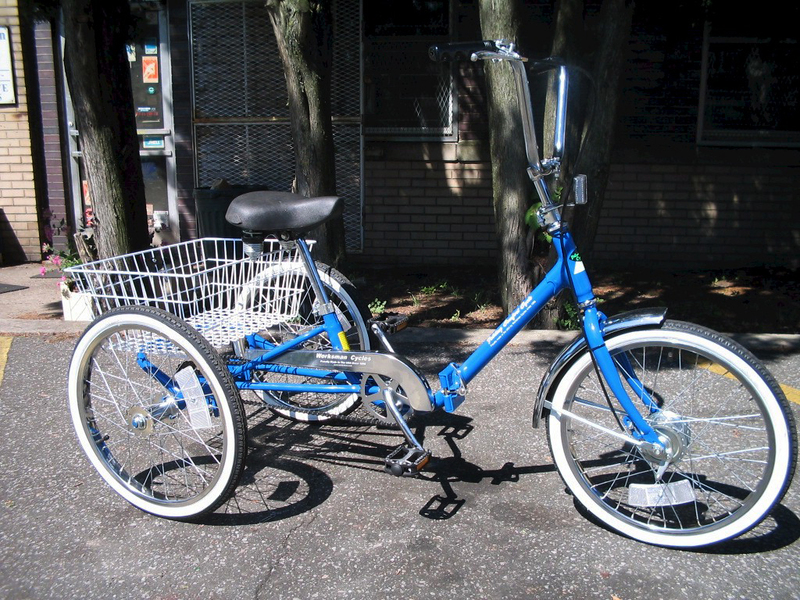 It is very sturdy and I feel safe, so it has become a new pleasure--I love my trike! The only down side is that I thought, since it is a folding trike, that I would be able to put it in my trunk and take off whenever I wanted. Well, that has not worked. Right now we are looking at a rack that will hold one bicycle and one folding trike. I don't mind that because my Worksman Port-O-Trike3CB brings so much joy into my life! Thank you Worksman! I bought this trike after realizing that my 7 year old daughter is not likely to learn how to ride a bicycle any time soon. However, she liked to play with her old tricycle and carry things in a basket. This trike has been the best toy I have ever bought. I upgraded the wheels, fenders, and splurged for the ding dong bell. We live out in the country and have a gravel road and so far she has had no problems getting around. The trike is rated for up to 225 lbs so my parents and I could also ride it. So far I am pleased with its functionality. My dad did mention that it could be a challenge to assemble. He is a handy guy that has built everything from furniture to houses so I believe him when he said that parts of the assembly process were not easy. So far I am pleased with the purchase. Although I am glad I had my dad to put it together. I bought this 3 speed folding tricycle from Worksman and had it converted to electric using the kit they recommended. I couldn't be happier with it. I wanted the best, not the cheapest and that is what I got,made in America quality all the way. Actually the price was only a bit higher than a made in China piece of junk. I'm glad to say we still have craftsmen here in the US. I'm too old to be a safe automobile driver (slow reflexes) so I turned in my license. I'm in too good shape to need a scooter and this is the perfect in between step. Pedal when you can for the exercise and kick in the electric when you poop out or come to a steep hill. Great for grocery or other shopping and it gets me to where the fishing is. Shipping was slow but worth the wait. The only problem was that the owners manual wasn't received. I love my TRIKE. It is so easy to peddle and ride everywhere. I am 68 years old and can ride it with ease. I put my little dog in the basket (I hooked him in with a leash) and he loves being with me and only tried to jump out once. This TRIKE is wonderful. It's easy to get on and off, the large seat is very comfortable, you do not have to ride it fast like a bike to keep it upright, and it is beautiful on top of all that. The really amazing thing is that it is made in the good old USA, now that is worth paying for isn't it. You can really tell the quality of this trike from the design and materials that it is made of. Truly appreciate the workmanship of the people at Worksman for their quality of work. Thank you so much for my trike. This trike is a good product in most respects but not all. The quality of material and workmanship is a positive and the fact that it folds makes it easier to store and somewhat easier to transport. It has a very short turning radius and is really stable. On the downside, it is very compact and not easy to use for someone with long legs. Transporting the trike using a trunk-mount rack requires a 3-bike rack leaving no room for even one additional bicycle. A couple of improvements Worksman might consider would be (1) a gear shift mechanism incorporated in a hand grip so shifting gears does not require pushing and pulling on a lever, and (2) a quick-release that would keep the trike locked in the folded position. I'm 71 years old and over 200 lbs and wanted to ride a bike again to get some exercise. I tired an electric assist bike, which was too heavy and hard to pedal. Then I tried a traditional ladies' bike, but I couldn't balance on it. I tried an adult tricycle, but it was hard to steer and control. I went to another bike store to try a cruiser designed for older people. Someone had just brought in a Worksman 3sp Portotrike to resell. This solved all my problems. It's easy to ride and pedal with no fear of falling over and cute to boot. I'm back in the saddle again. I cannot review at this time. I am battling progressive supranuclear palsy (PSP) and that was why I was wanting the increased stability of the tricycle over a bicycle. However with the back peddle brake I find myself going in tiny circles to the left! I was just beginning to straighten myself out when I suddenly started suffering from DJD of the right hip so I have to have a total hip replacement. So when I'll get back to the trike is any body's guess. Do you have any comments or suggestions about the small leftward circles ? ?